Magic Mike Likey: Excerpt From "I AM Magic Mike Likey-The Collector's Edition"
Excerpt From "I AM Magic Mike Likey-The Collector's Edition"
Here's the introduction to my book, "I AM Magic Mike Likey! The Collector's Edition". If you enjoyed my TV-show in Winnipeg from 1985-1994, you'll LOVE this book, which is filled with humorous anecdotes and LOTS of pictures! It's September 2016, and I sit here and ponder all of my blessings with wonder and awe. 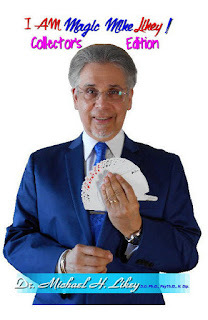 At this point, I'm looking forward to spiritually-counseling my Theocentric Psychology clients, to holding a few metaphysically-oriented workshops, to writing several more books, and to the several magic-shows I'll be performing over the next few months, in addition to learning and honing more magic-tricks! It was in June of 1985 that I started video-taping the premiere episode, 58-minutes in length, of my television program "Kiddie Cabaret", which subsequently aired the following week on VPW 13 in Winnipeg, Manitoba, Canada. It was a guaranteed pilot, which essentially meant that I was given approval to record subsequent 30 (really 28) minute shows ad-infinitum for airing at a weekly, regular time. I was only twenty-nine at the time, but I had dreamed of having my own television show (producing and starring in one) ever since watching "Magic Tom's Surprise Party" and "The Magic Land of Alakazam" on TV as a child! These shows featured a magician who did amazing illusions week-after-week, and I never tired at the wonders and marvels that these fellows had to offer. Every day (in Magic Tom Auburn's case) at 4:00 p.m. after school I sat myself down in front of the TV to see what tricks Magic Tom would do this time. He also featured a sci-fi adventure serial from the 1940's, "Rocket Man" which I embraced wholeheartedly as well. In those days in Montreal, Canada, all we had in the way of Canadian children's programming on television (besides American shows) was "The Friendly Giant", "Razzle Dazzle", "Tween Set", "Butternut Square", (later "Mr. Dressup") and "The Forest Rangers", all produced in Toronto, as well as "Johnny Jellybean", "Romper Room", and "Chez Helene", all produced in Montreal, in addition to Magic Tom Auburn's "Surprise Party". What a surprise indeed it was for me daily as I eagerly soaked up the tricks and sleight-of-hand that Magic Tom did; Tom was such an influence on young, Montreal, aspiring magicians, that they all called themselves "Magic this", or "Magic that", hence my professional stage-name, "Magic Mike". 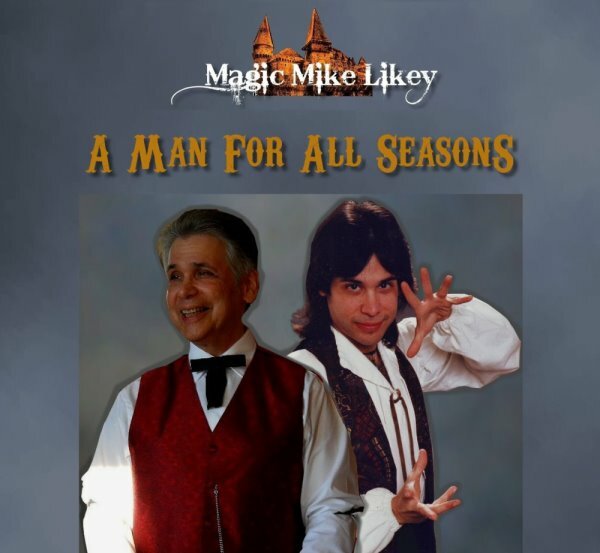 with the onslaught of other "Magic Mike's" in the 1980's and '90's, I later had to specify "Magic Mike Likey", but for many years in Winnipeg I was known locally as "Magic Mike". Winnipeg even spawned a young magician, "Magic Joey", an alcoholic beverage known as "Mike's Magic Elixir", and a high-end amusement centre in a Charleswood mall, "Magic Mike's"! My, the power of television, although quite frankly it was Public Access television, which essentially meant that anyone and his dog could have a TV-show on that channel because of CRTC regulations. CRTC stands for Canadian Radio and Television Commission. The CRTC would later (in 1994) rescind it's law, causing all Public Access channels across Canada to shut down, and with that the end of "Magic Mike & Company" as well as numerous other TV-show on that channel which Winnipeggers refer to as "The Golden Age of Television". The Golden Age of Television included such luminaries as "The Pollack and Pollack Show", and "The Continentals", more on these later on. There was also "The Jaret Sereda Show" and "The Noreen Shane Show", both of which featured and supported local talent. When local Winnipeg television stations decided to shut down production of all children's programming in 1994, gone were new productions of "The Fred Penner Show" and a show on broadcast television that I had been a regular on since 1990, "S'Kiddle Bits" with Juno-award winning-host, Joey Gregorash. This downward spiral (which resulted in my relocation to Vancouver, Canada in 1994) in television quickly upturned several years later when, in 2000, the CRTC reinstalled it's Public Access policies once again. But it was too late for most of us children/family entertainers who had long moved onto better things. Thanks to television of the '80's and '90's, we were given an indelible mark on the consciousness of the public; it still amazes me to this day, how many Winnipeggers of certain generations still recall "Magic Mike's Castle", one of my three television shows. Back to counting all my blessings. If the face of Winnipeg television wouldn't have changed back in 1994, I wouldn't have been motivated to move onto other things. Don't get me wrong; for years in Montreal, Toronto, and Winnipeg I had gainful employment as a Graphic Designer, Cartoonist/Caricaturist, and Magician, all at the same time! It still amazes me to this day, that I was able to buy a couple of houses on my salaries from these vocations, but nonetheless, I'm still grateful. With the loss of the television programs, and several of my regular clients, it was as if the rug was pulled out from beneath me, and I was thrown off; normally I would have just substituted these clients for several others, but there was something about losing the TV-shows that threw me off; it was as if I had "lost my gimmick", so-to-speak, as I was the only local magician to have a TV-show, and also, I'm told, it was the world's longest, regularly-produced TV-show about magic in the world! So there was also a record there; but it still threw me for a loop, and desperately seeking a new gimmick, I wrote and recorded in 1994 my second album, "M'ystery", the follow-up to my 1990 self-titled album "Magic Mike" which sold out in Winnipeg. I recorded it and mixed it in 24 straight hours, no sleep, with dedicated friends and musicians who had stood by my side for 13 years. With this in hand and a van filled with my belongings, we made our way to Vancouver in September of 1994. My girlfriend and I at the time had paired down six rooms of furniture into a crammed mini-van along with our two cats, seeking our fame and fortune. In retrospect, I should have dealt with and healed the trauma of apparently losing so much, (the shows and clients) but I did not, and subsequently suffered for it, arriving in this sight-unseen, bright and shiny new town with a bad attitude consisting of anger, resentment, and defensiveness. I slowly healed myself, but then I was treated very poorly (with verbal abuse almost daily and threats of physical abuse) at a New Westminster market where I had set up my retail business. I was unaware of the unusually large amount of drug addicts and people suffering from mental illnesses who resided there. Knowing this helped me to keep some semblance of perspective and objectivity. A year or so later, I began to lose all of my family members who resided in Toronto and Montreal, including my dad and favorite aunt in 1995, and favorite uncles in 1996, followed by my mother and other family members a few years later. This all resulted in my redefining myself yet again, (I had to "adapt" numerous times before) but also to finding "the real me" for the first time. I began to turn inward once again for answers, and I've never looked back! What seemed like tragedy and loss eventually resulted in my growth into a Clinical Hypnotherapist, Doctor of Theocentric Psychology, International Author, and BlogTalk Radio Host/Producer. For awhile I was right "down in the trenches", helping to heal the local down-and-outers, while in reality I was also healing myself. Now 23 years later my "humanitarian work" is sincere, not just about myself hanging on for survival. Again, I'm grateful for this. If you want to learn more about myself as "Dr. Michael Likey", find me on Facebook and search me on Amazon. This book is all about Magic Mike Likey. In reference to that; part of my re-empowering myself and coming back to magic after a 10-year absence, (to study and get three Doctorates) I jokingly and semi-seriously said, "I AM Magic Mike"! This was after returning several years ago to Winnipeg for a couple of book-signings, ("The Science of the Soul") and having a close friend say to me, "Smile, your glow rubs off on people; you glow when you smile; you ARE Magic Mike!" I realized the "power" in that statement: the character of "Magic Mike" that I had created and brought to life on stage and on television brings light and sunshine to people's lives, through his corny jokes, wondrous magic, and music; it re-empowers others, so why not re-empower myself through the very character that I had created? Why not indeed! Thus, the title for this book was born, "I AM Magic Mike Likey!" to help to convey a little of the real magic in life that I've been able to experience, and hopefully to share with you to some degree. The various chapters in this book are in no particular chronological order, merely random musings of a mad magician! As a thought, idea, or remembrance came to me, I wrote them down. There is no rhyme nor reason to this book, outsiders will not likely get too much from it; Winnipeggers of "certain generations" most certainly will, and it's for you that I'm lovingly sharing my life as Magic Mike Likey!